The Courier rides again! New shots of Microsoft's "digital journal"
Ever since we saw those first leaked shots and videos of Microsoft’s Courier, we’ve all been itching for more. I personally thought it was particularly wonderful, and was dismayed when they decided to show off a lackluster Windows 7 tablet at CES. I’ve asked about the Courier at very nearly every Microsoft event I’ve gone to, and asked all my contacts to keep their ears to the ground… but Engadget, damn their eyes, got to them first! Well, I’m just happy to see my baby again. The real surprise here is the size; I’m not sure exactly what size I thought it was from the previous demos, but the sizes quoted are that each half is about 5×7″, making the whole thing about 10×7″… or almost exactly the size of the iPad. 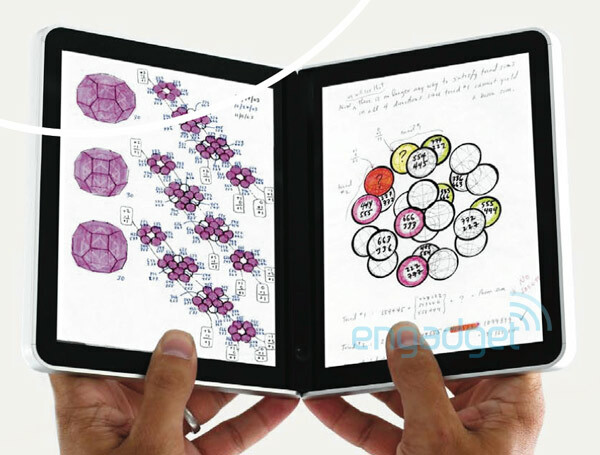 Now, I can’t be the only one that thinks it would be nice to be able to fold my iPad in half and put it in my pocket. Oh, and it weighs just over a pound. Want? It was in vain for us to speculate on what the little thing ran before, since it was a totally custom interface, but I think Microsoft has decided that it’s better to make it a “big small device” rather than a “small big device.” You understand? They’re not shrinking a Windows 7 tablet, they’re making something new driven by a Tegra 2, which actually puts it ahead of the iPad in terms of processing power. The dual input (touch/stylus) I think is also a bonus, though of course Apple seems to have the market cornered on really nice touchscreens, so we’ll have to wait and see how it actually responds. Depending on the resolution, handwriting might be weird, too. Again, until we have a hands-on, it’s hard to say. They’re saying a late-2010 release. 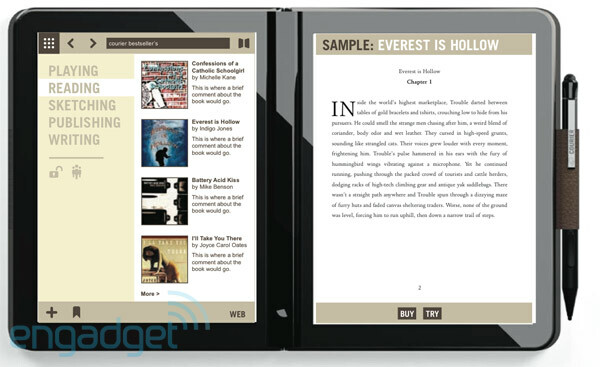 I’m liking the form factor for an e-book reader, but it might get in the way of the creative aspirations of next-generation bookmakers. Either way I’m sold on this thing right now. More shots and video (most of which you’ve seen, but still) over at Engadget.